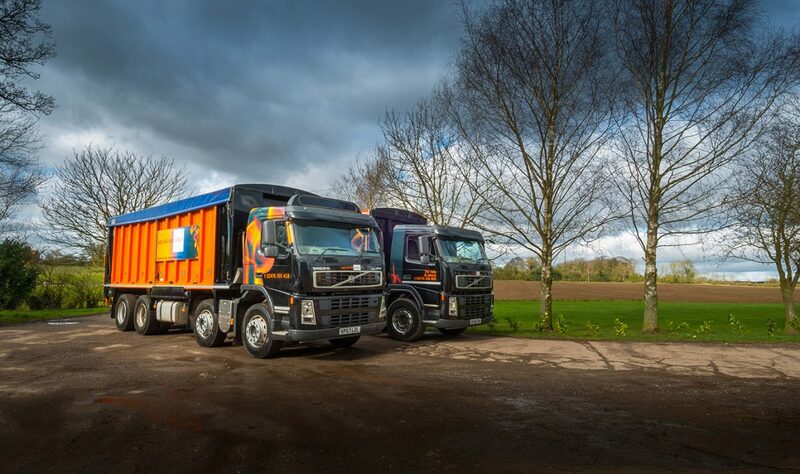 We are extremely competitive on price and can supply you with ENplus A1 standard pellets that are BSL registered and suitable for the Renewable Heat Incentive (RHI). Please request a personal quote by using our Quote Page. 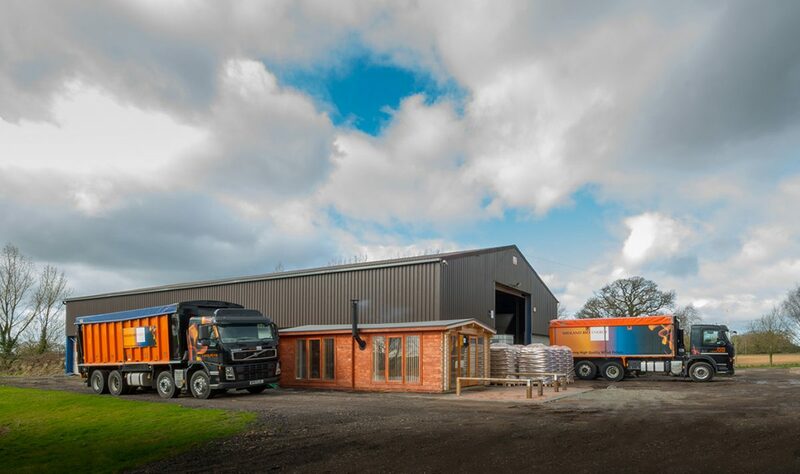 Our premium wood pellets can be ordered ‘blown’ or in bulk – i.e. loose – without individual bags. Download a Full Wood Pellet Specification Sheet here. 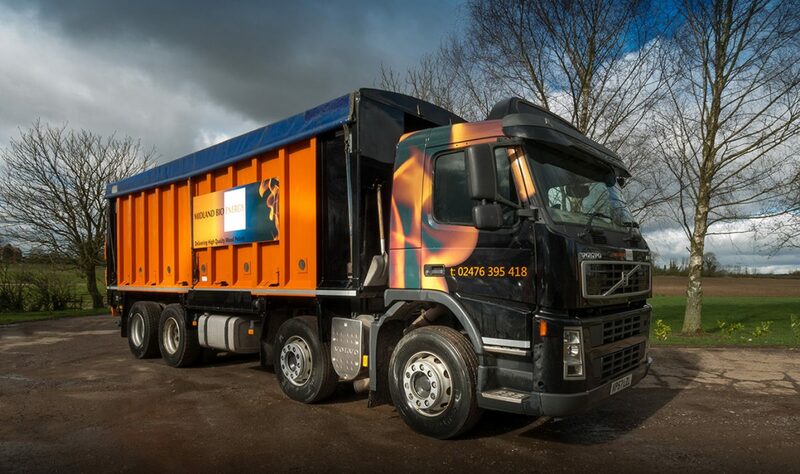 Blown or bulk wood pellets will be delivered by a 26t lorry – please ensure you are able to accommodate both the delivery vehicle and the volume of pellets you have ordered. Please see here for further Delivery Information and Checklist. Prefer to buy your wood pellets bagged? We can deliver bagged wood pellets to your door – see our Bagged Wood Pellets page. This is the first delivery to a store since modifications were made. The store was built in 2009 with some design flaws becoming apparent. We were asked by the Management company to offer advice on how to rectify these. We recommended that one of the 90° bends in the delivery pipe was taken out to reduce the impact on the blown wood pellets. As this was at the bottom of the pipe, it was unnecessary and was removed to leave a straight pipe which you can see in the picture. We advised that the target mat inside the store was incorrectly positioned causing the blown wood pellets further unnecessary impact and degradation, due to the mat being too close to the inlet pipe. This was also causing the pellets to ricochet off the walls causing a further impact. Two simple measures that enabled safe and effective deliveries to take place with no further problems. We further advised on raising the bunker floor to 45° and placing Perplas sheeting on the bunker slope, which has excellent anti-friction properties. This would help with the flow of the pellets into flexi pickups. We like to be involved at an early stage during the construction of a new site so that any obvious problems can be avoided. Please contact us, we will be happy to help. Inside the boiler room during delivery. Notice the absence of any atmospheric dust from the store which is indicative of a good delivery system and a well designed intake and store room. 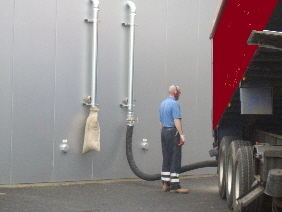 An inspection of the blown wood pellet store was being made by a member of staff. This was done to ensure the delivery of the wood pellets was satisfactory, following the modifications. Once this was deemed acceptable the delivery continued. 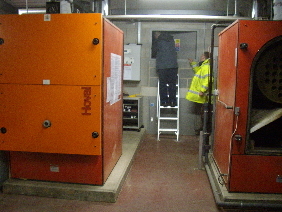 In the foreground are two Hoval STU 250kw boilers providing heat and hot water for an office complex. The boiler on the right had been stripped down for its pre-season clean.